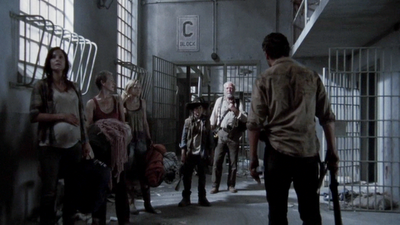 Though the Group is pleased to have breached the perimeter of the prison, Rick refuses to allow them to rest. They push onward and are able to clear out and secure an entire cellblock. Lori confesses her fear of dying to Hershel. 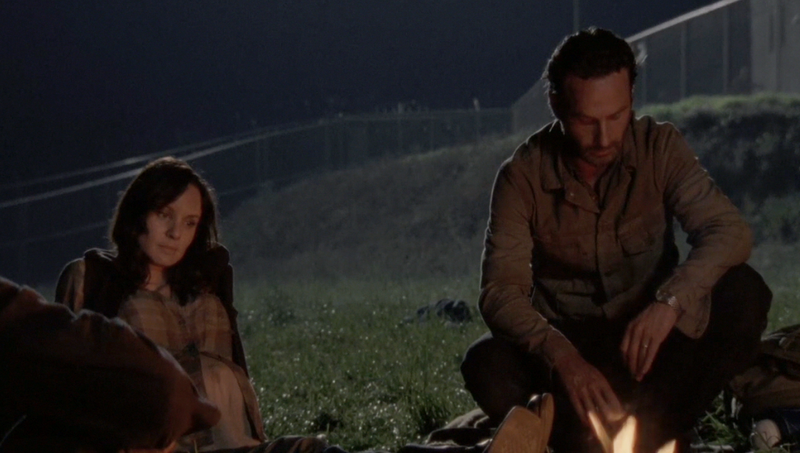 And her fear of harming Carl or her unborn child if she turns. 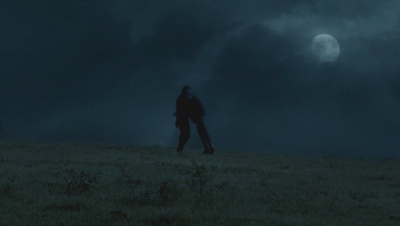 She stresses to him that he must not allow her to turn into a Walker. As they choose the cells that they will call home, they enjoy a temporary moment of peace. As usual, the peace is short-lived. 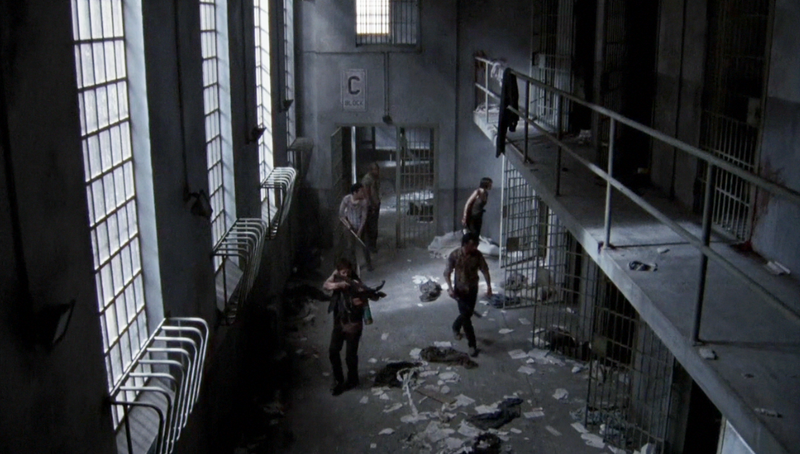 The next day they press further into the deepest parts of the prison to clear out Walkers. When Glenn and Maggie are separated from the Group, a distracted Hershel makes a catastrophic mistake. He steps too close to a Walker lying on the floor, and is badly bitten on the leg. 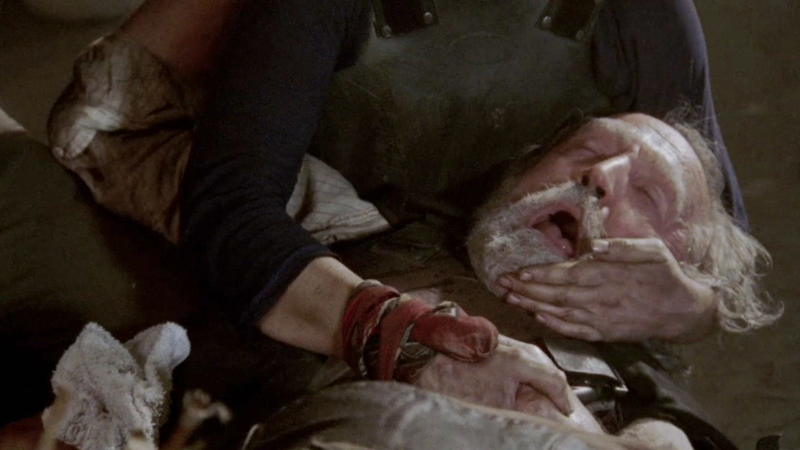 In a bold and desperate move, Rick amputates Hershel's leg below the knee. The Group has suffered another devastating blow. 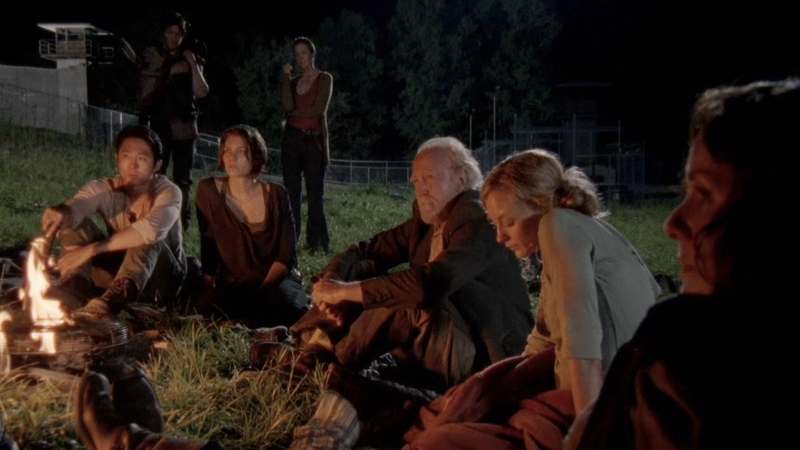 There is no time to eat…everyone is needed to help Hershel. It was a good thing that they shared breakfast together earlier that morning. 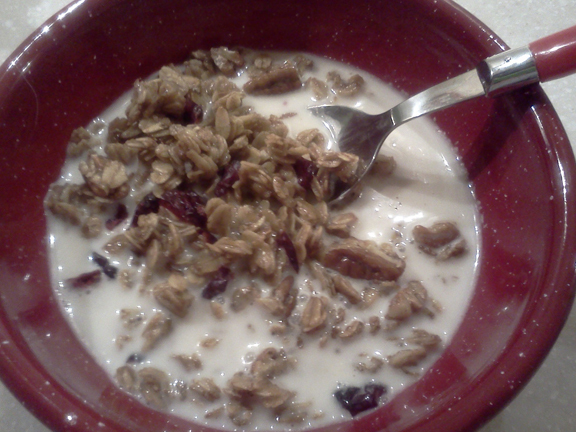 With very limited supplies, they would have had at least a few staples to prepare Skillet Granola. High in fiber (and fat), it would give them the energy to clear more cell-blocks of Walkers. And when the dead rise; don't step too close to Walkers lying on the ground! Heat the olive oil in a large Dutch oven (or cast iron skillet) over medium heat or medium-hot coals. Add the oats to the skillet and stir well. They will start to toast and turn a bit crispy. Stir well, for about 5 minutes. Add butter flavored shortening to skillet and allow to melt. Add honey and brown sugar and stir well to coat oats with melted shortening and sugar/honey mixture. Add spices if desired and stir well. Continue to cook and stir constantly for another 5 minutes to make sure the oats are evenly coated. Remove from heat and spread mixture out into a 9 x 13 inch baking pan. Allow to cool to room temperature and then stir in the vanilla extract and whatever chopped nuts and dried fruit you were able to scavenge. 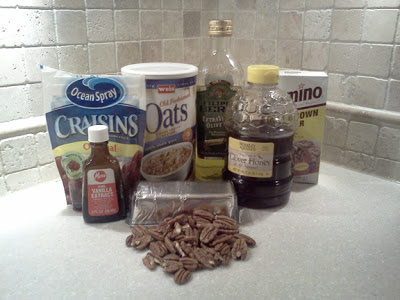 Store the granola in an airtight container or sealed plastic bag. 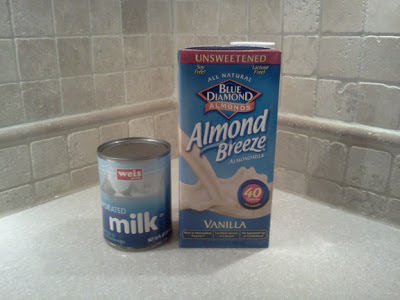 Serve with boxed soy milk, boxed almond milk or canned dairy milk. Initial reports of a walled stronghold in Coweta County, Georgia have finally been verified. Firsthand accounts confirm that a violent leader has proclaimed himself "Governor" of this small town. Tales of a militia prowling the surrounding counties in search of supplies have continued to terrify the local communities. As Walker Herd counts rise; the existence of an additional threat in this part of rural Georgia remains a concern. As more information becomes available, the WDSCB will provide updates. Reports have also emerged of two female survivors in the area. Normally, more survivors would be a cause for celebration; however this particular pair reportedly travels with two captive Walkers. Sightings have been reported in the woods surrounding Newton as well as a local Sportsman Deer Cooler. Until more information can be gathered, we would advise everyone in the area not to approach these two women. They should be considered armed and dangerous. The WDSCB also has a confirmation of the existence of another survivor Group. For their own protection, they have not revealed their location. But we know they are there and it gives us one more reason to be thankful. Today of all days; let us be thankful for what we have. And who we have. Preheat oven to 325° or heat campfire coals to very hot and allow to turn to white-hot ash. In a Dutch oven, over medium heat (or medium coals), melt shortening in water. Add stuffing mix and stir well. Layer half of the stuffing in a 8" x 8" baking pan or a cast iron skillet. Drain Green Beans and layer over the stuffing. 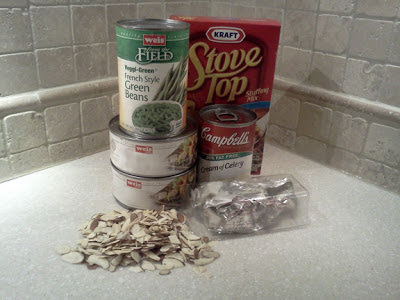 Sprinkle almonds over the green beans. Drain turkey meat and layer turkey over the almonds. Cover turkey meat with remaining stuffing mixture. 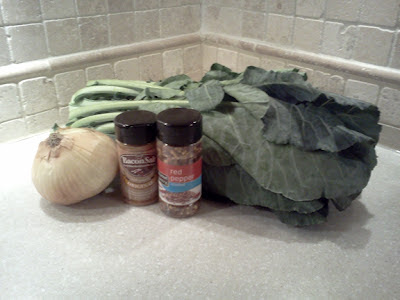 Combine cream of celery or cream of mushroom soup and 1 can of water. Stir until smooth. Pour carefully over the stuffing layer. Bake at 325° for 45 minutes to one hour. Alternately, cover pan or cast iron skillet with aluminum foil or a baking sheet placed over the pan or skillet. Place over grill over hot coals and allow to bake for 25 minutes. Remove and check to make sure the ingredients are heated through. Return to grill over coals if necessary and check every 5 minutes or until hot. Serve immediately with Sweet Potato Biscuits. Preheat oven to 450° or heat campfire coals to red hot and allow to turn to white-hot ash. 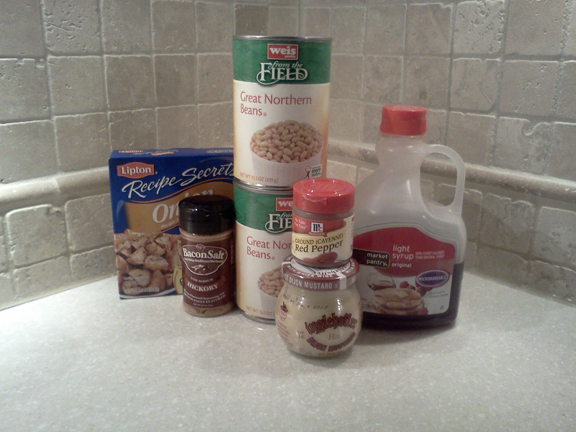 Mix all ingredients (except Cranberry Sauce) in a large bowl. Stir until blended into a ball of dough. 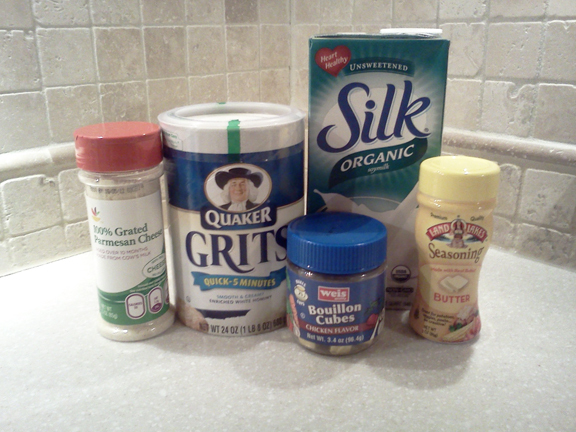 Place dough on a clean, flat surface that has been sprinkled with about a 1/2 cup of Bisquick. Knead three or four times to allow the dough to absorb more flour. Pat into a circle that is about 1/2 inch thick. Cut biscuits with a biscuit cutter or a drinking glass that has been dipped in Bisquick. Place very closely together on a baking sheet and make sure the edges touch. Bake in preheated oven for 14-16 minutes or until they are a golden, orange-brown. Alternately, place over coals and allow to cook until the tops are spongy and appear dry. You may want to flip them like a pancake to ensure they are done all the way through. 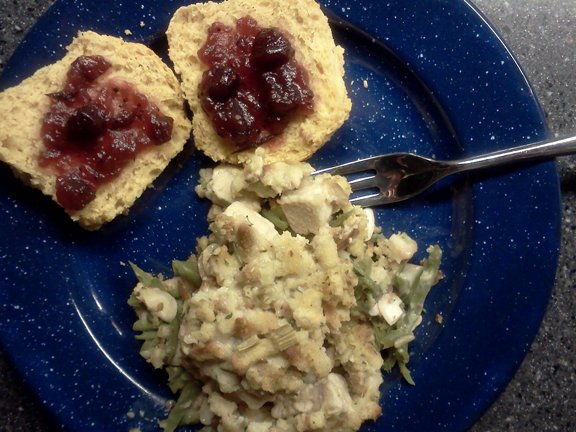 Split and spread with whole cranberry sauce if desired. Serve with Turkey Mackinac. A long, hard winter has broken the bodies of the Group. But their spirits remain strong. They have run at a relentless pace throughout the cold months. Rick has refused to let them stop for more than a day and they have only minimal supplies. With growing herds wandering aimlessly and seeming to dog their tracks; they have been reluctant to get too comfortable anywhere. 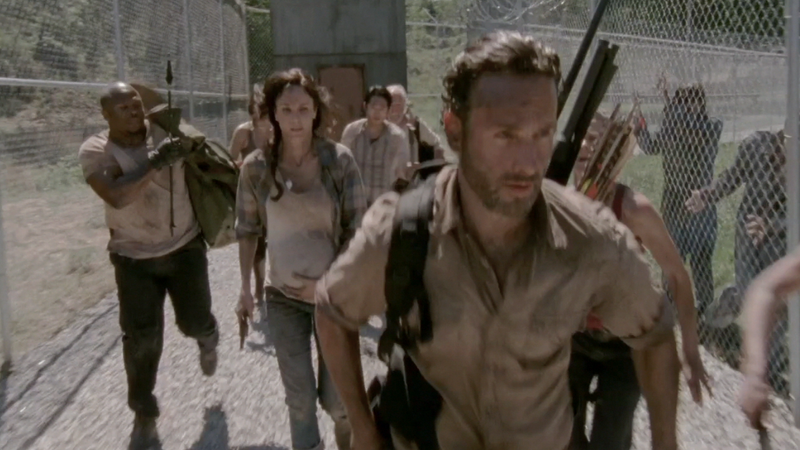 Lori's rapidly advancing pregnancy however, finally forces Rick to find a more permanent home for the Group. He convinces them that a prison would be an ideal place to call a halt and build a base. The prison would contain an infirmary, an armory and a cafeteria with a kitchen. It would likely have everything they would need to survive a long, long time. So the prison takeover begins. 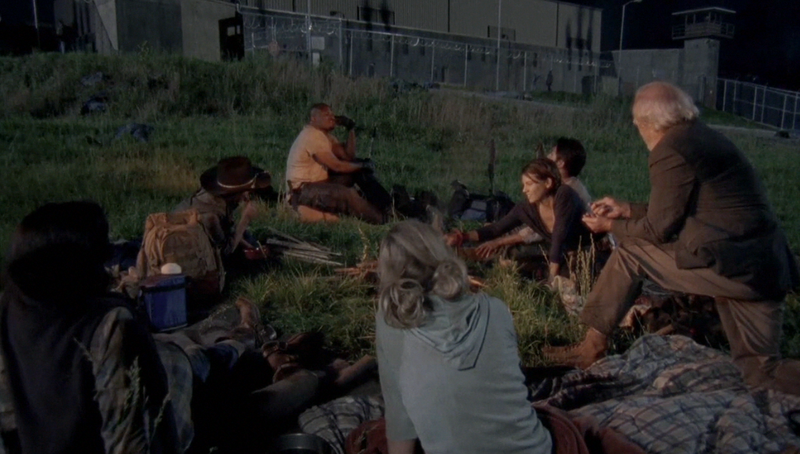 And by nightfall, they are able to gather around a campfire inside the perimeter of the prison. 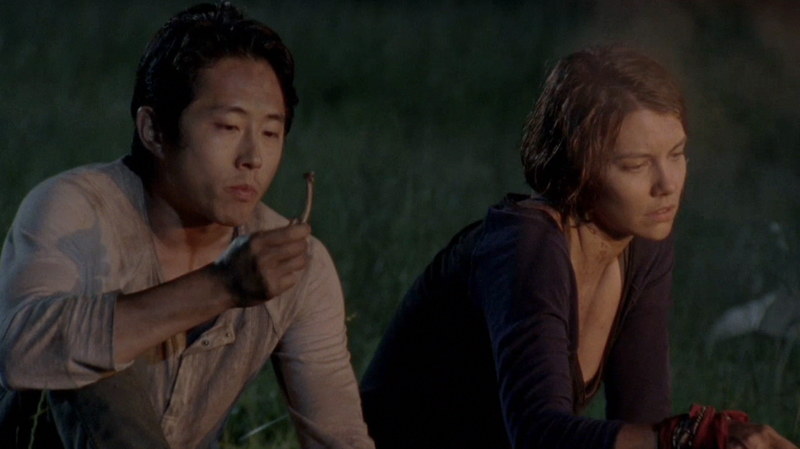 There is only a little meat from Daryl and Rick's efforts at hunting to share among all ten of them. But the Group would have had scavenged at least a few items to serve alongside it. 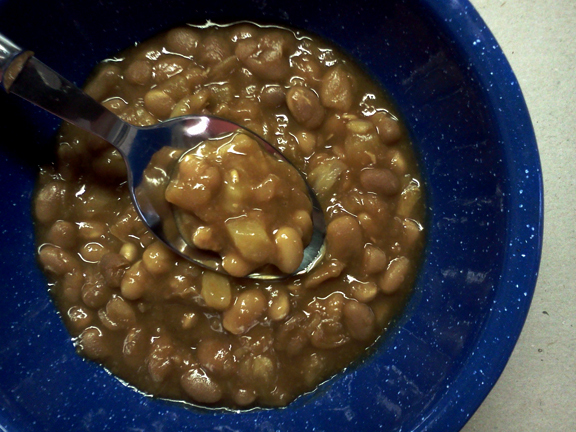 Vermont Campfire Beans are a twist on the traditional Boston Baked Beans. Maple syrup stands in for the usual molasses; while Dijon mustard and cayenne pepper supply unexpected heat. And when the dead rise; don't eat dogfood. In a large Dutch oven (over medium campfire coals), combine beans (drained), onion soup mix, bacon salt, syrup, mustard and water. Stir well and allow to come to a boil. Cover and allow to simmer for 10 minutes. Add a dash of Cayenne pepper and stir. 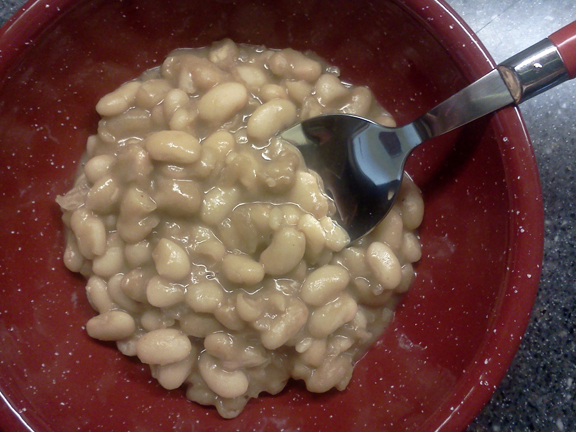 Taste and add more cayenne pepper if you wish. Serve with whatever meat your group can find. After Shane's death, Rick attempts to explain the events that have taken place to Carl. But the sight of hundreds of Walkers closing in sends them both running for the Farm. 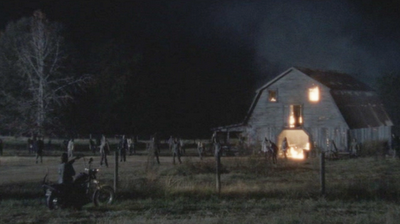 The Group had heard gunshots and Daryl goes back outside to find Rick and Shane. The moment Daryl, Andrea, Hershel and Glenn step out onto the porch, they see the monstrous herd of Walkers bearing down on the Farm. 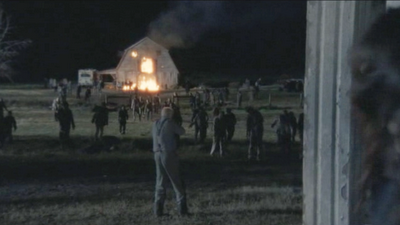 Hershel decides that no matter what; he will defend his farm. The Group quickly rallies to the Greene family's side. 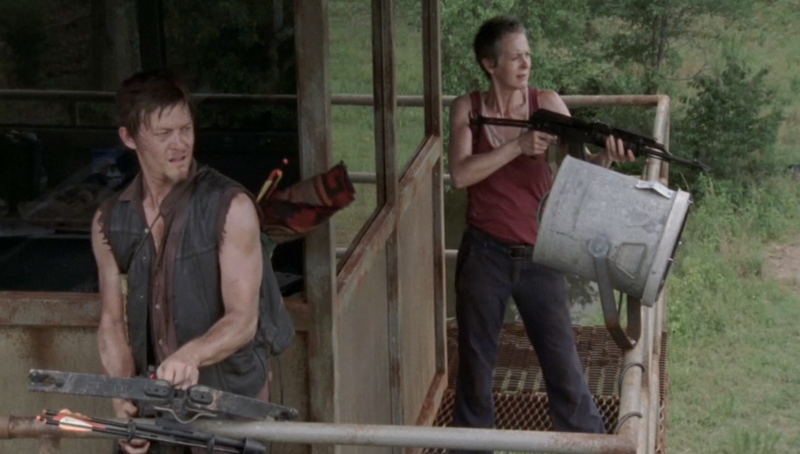 They take to their cars in pairs, both to draw the Walkers away, and to destroy as many as they can in the process. 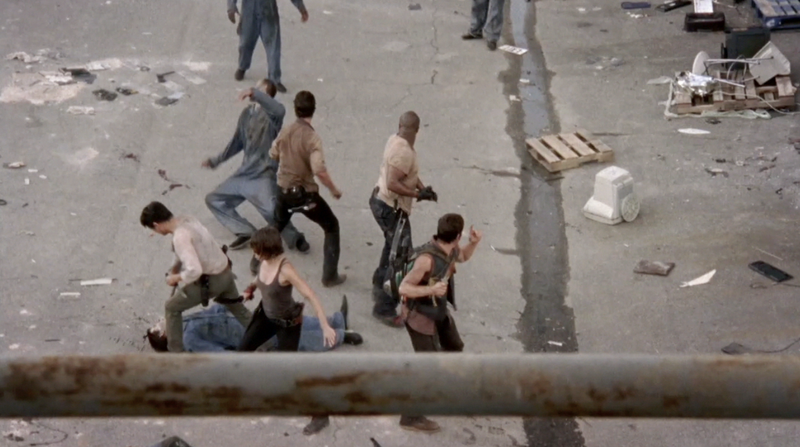 It is a near impossible task and they quickly realize that there are simply too many Walkers. 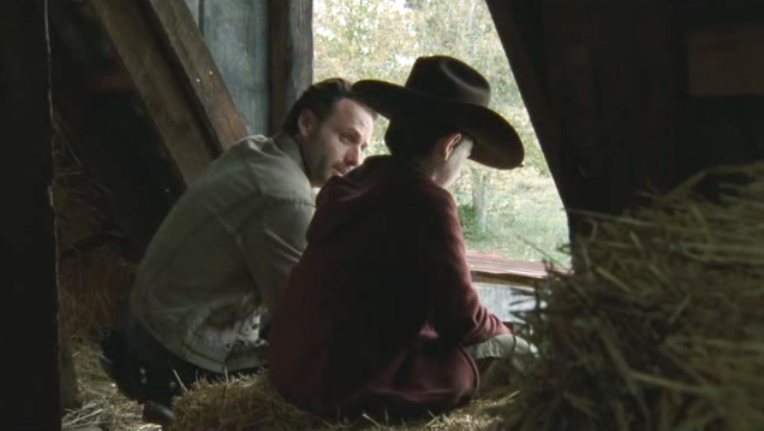 Rick and Carl make their way to the barn. 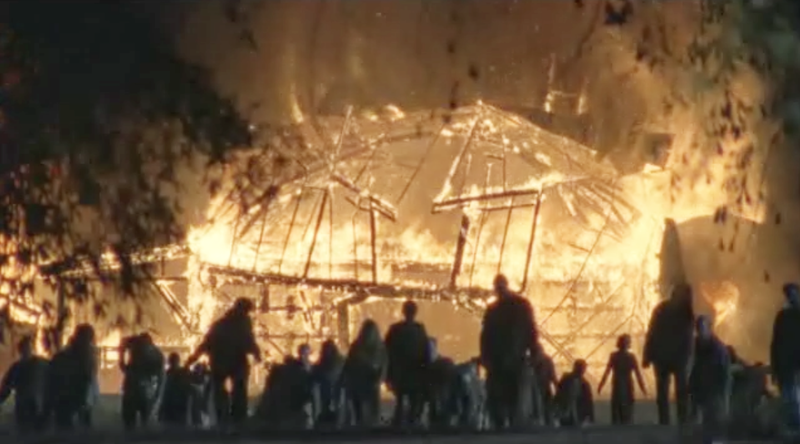 Realizing that there is no way to get to the others; Rick sets the barn on fire and hides in the loft with Carl both to avoid the flames and to alert the Group. The plan works and Jimmy takes the RV to retrieve them; losing his own life in the process. The Group is scattered; each of them escaping in pairs as the farm is lost. Andrea is left behind in the chaos and flees with their bag of weapons. Hershel and Carl return to the site where they first broke down. The rest of the Group make their way back to the same site and are overjoyed to reunite with each other. They mourn the loss of Shane, Jimmy and Patricia; but Rick refuses to allow anyone to return and search for Andrea. He wants them to get as far away from the farm as possible. Rick finally shares the information that he's been hiding. The entire population is already infected with the plague that has destroyed civilization. No matter what the cause of death; everyone will rise as one of the Walking Dead. The Group is understandably angry that Rick withheld this from them. Their hope is almost lost when they receive the final blow: Rick confesses that he killed Shane. They have no shelter; hardly any fuel; very little ammunition and only the clothes on their backs. As they gather around the dying fire, the only food they would have had would be a few canned items they kept in the cars for emergencies. 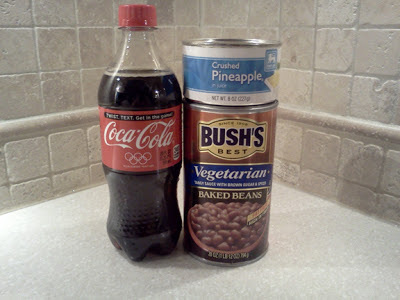 Soda Pineapple beans contain only three ingredients but the flavors blend well and the protein and carbohydrates will be nutritious and filling. They would have to ration carefully to make sure everyone got a little bit. Be sure to keep extra cans of beans and pineapple in each of your Group's cars. And when the dead rise; Stay Together and Hold Fast! Combine all ingredients in a large Dutch oven. Heat over medium hot coals until hot and bubbly. Serve immediately. The next morning, an emotional Rick Grimes speaks at the funeral of Dale Horvath. 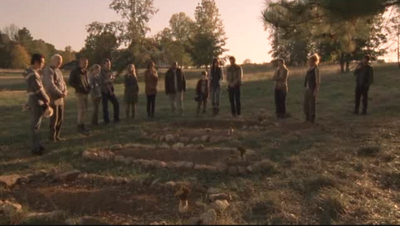 He urges the Group to honor Dale by holding onto their humanity and pulling together to survive. The change of the seasons mirrors the change in the Group's dynamic. 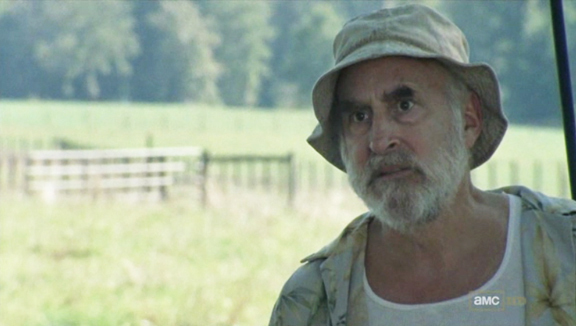 Dale was the voice of reason and with his death, Rick realizes that he must now fill that role. And that Dale's way was the right way. 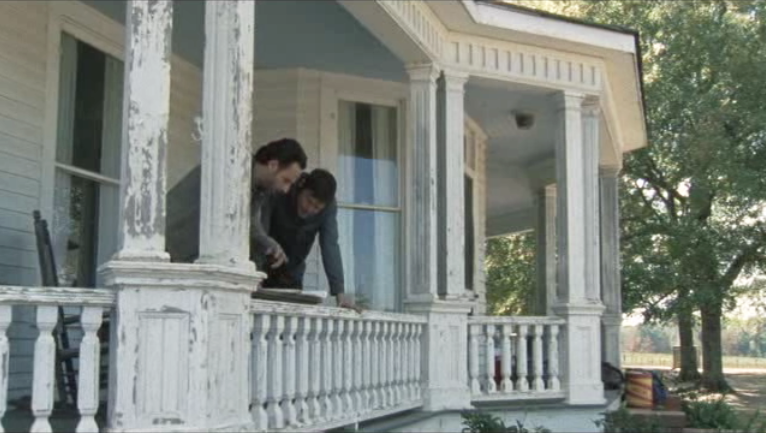 Rick plans to take Randall to Senoia with Daryl as his back-up. 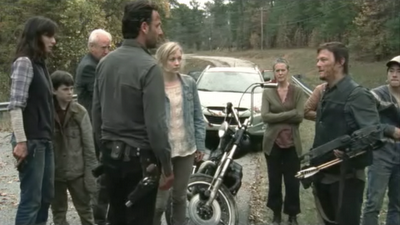 Daryl assures Rick that he has no problem with the decision. 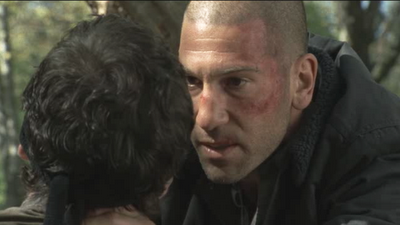 Shane is incensed that Randall is to be released and that Daryl is Rick's new confidante. A reformed Hershel allows the Group to move into the homestead and preparations are made to stockpile food and supplies and secure the farm for winter. Lori makes an awkward attempt at an apology to Shane for her role in their affair. Shane gives the apology far more weight than Lori had intended. Shane finally takes the step he's been planning. He releases Randall and promises the young man that he wants to join his group. 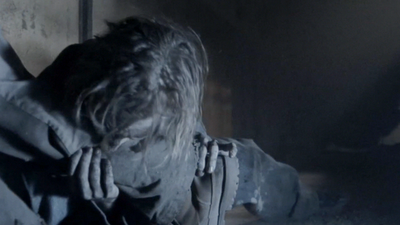 Once he gains Randall's trust, Shane breaks his neck. Running headlong into a tree; Shane then bloodies his own nose. He returns to the Group and claims he was jumped by Randall. 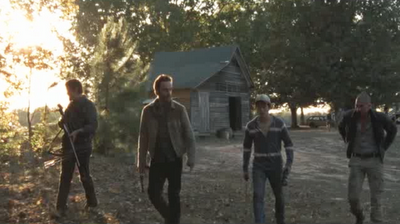 Daryl and Glenn join Shane and Rick for the hunt. 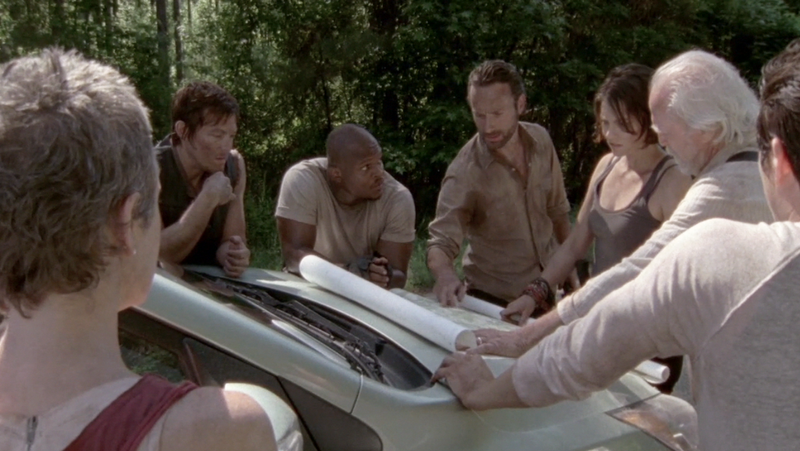 Daryl immediately doubts Shane's story. 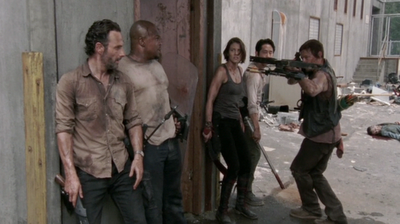 But Rick still separates them into pairs, sending Daryl and Glenn on their own. Rick reveals to Shane that he is aware of his intentions. 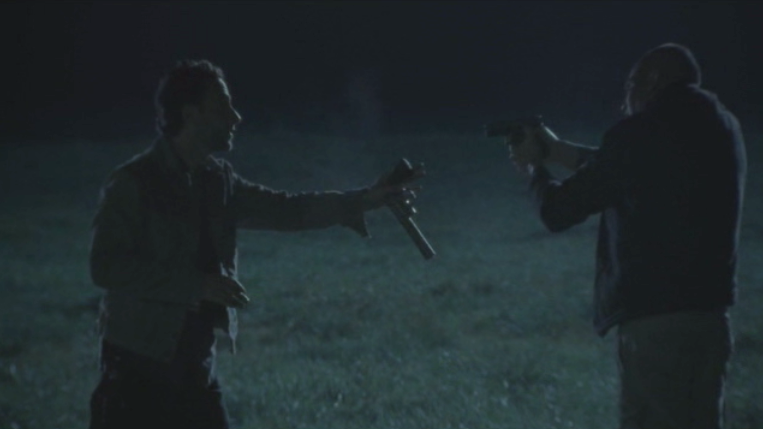 Shane makes an attempt on Rick's life; but it is the unlikely leader of the Atlanta Group that delivers a killing blow to Shane. 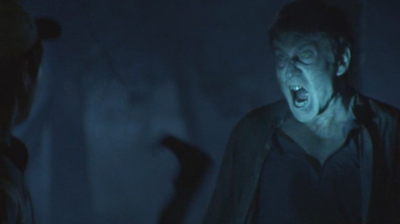 Rick is horror stricken when he realizes he has murdered his best friend in the presence of his son. Carl followed them into the clearing and saw everything. 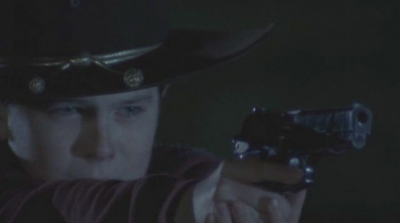 The boy appears to take aim at his father with a pistol...but then fires into Shane's body; which has reanimated. Daryl and Glenn make their own disturbing discovery when they find Randall. He had turned into a Walker, despite having no bite or scratch wounds. The Group has suffered yet another devastating loss. Though the Walkers may be a constant threat; the true danger is the existence of other survivors. The last meal the Group shared together would have been lunch. They would keep lunches simple in order to better ration their food supply. Carbohydrate-rich, with minimal protein would provide energy for the rest of the day's chores. Lemon Tuna Pasta is flavorful and fast to prepare. Containing only 6 ingredients; the recipe can easily be doubled or tripled to feed a larger Group. And when the dead rise; don't trade haymakers on the side of the road. Cook pasta in a large Dutch oven according to package directions. Drain well but reserve 1/2 cup of the pasta water. Wipe out the Dutch oven. Add about 1 Tbsp of Olive Oil. Add tuna (you can add the oil from the cans if you want to make it extra rich) and sauté lightly over medium heat or medium campfire coals. Break up the tuna into flakes. Add garlic, crushed red pepper and capers. Stir well for about 30 seconds just to make the garlic fragrant. Add drained pasta. 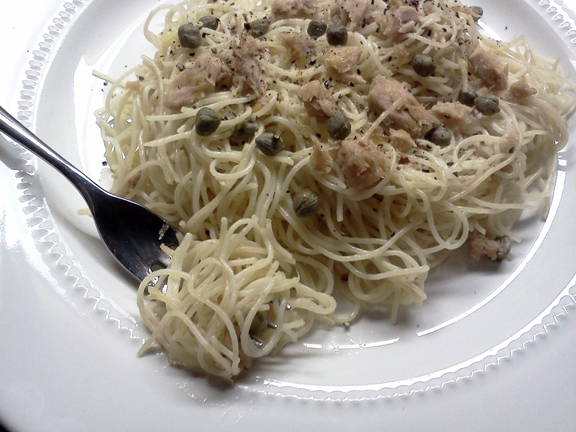 Toss well with tuna, caper and oil mixture. Add 1/4 cup of the reserved pasta mixture and toss again to combine. Add 1/4 cup of lemon juice and toss again. Taste and add kosher salt and black pepper to taste. Add the last of the reserved pasta water if needed. Sprinkle with parsley if desired. If you wish, add additional lemon juice to taste. Toss again and serve immediately. Theodore Douglas (T-Dog) had the good fortune to cross paths with the Atlanta Survivor Group after the Global Apocalypse began. When the Group ran short on supplies, T-Dog was quick to volunteer to return to Atlanta with Glenn and a small team to scavenge. Merle Dixon's drug-fueled, racist rampage almost cost the entire Group their lives; and in the process, Merle himself was left behind. T-Dog showed the depth of his humanity when he unselfishly volunteered to return to Atlanta one final time to rescue Merle. 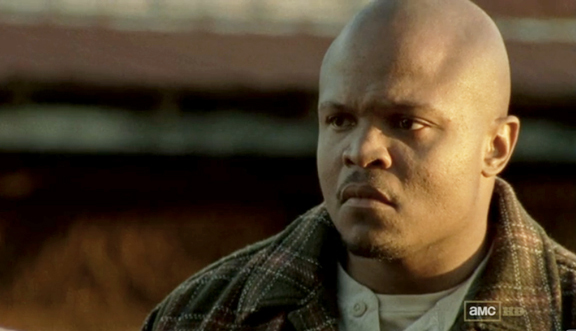 Though the mission was unsuccessful, T-Dog's compassion and generous spirit won him the respect of Merle's brother Daryl. When the Group later became separated in the search for Sophia, T-Dog almost lost his life to a septic infection. Glenn accompanied him for treatment at the Greene farm and the Group was finally reunited. 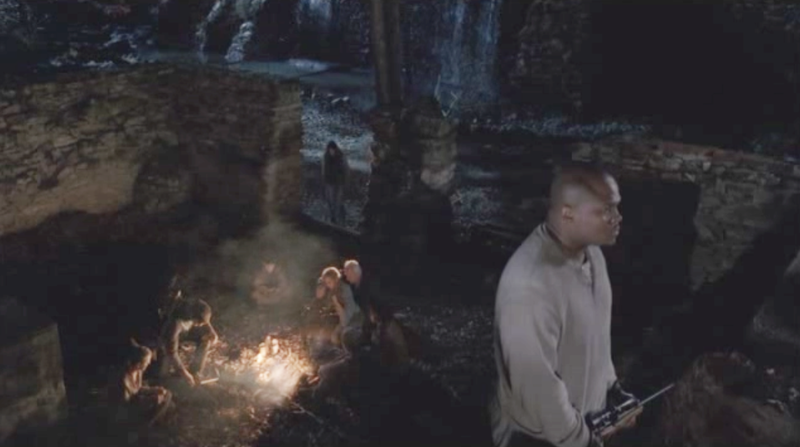 Though still recovering, T-Dog continued to aid the Group in the search. 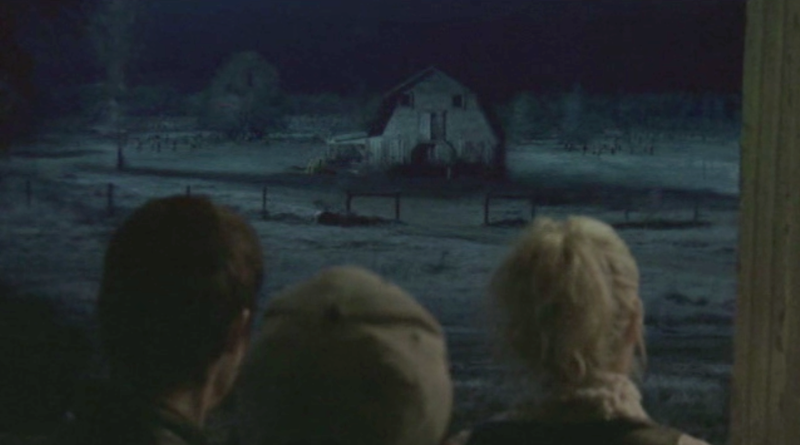 They would soon discover that Sophia had been infected and kept in the Greene's barn all along. As Fall came to Georgia, T-Dog worked with the Group to secure the perimeter of the farm and joined them as they moved into the Greene homestead. 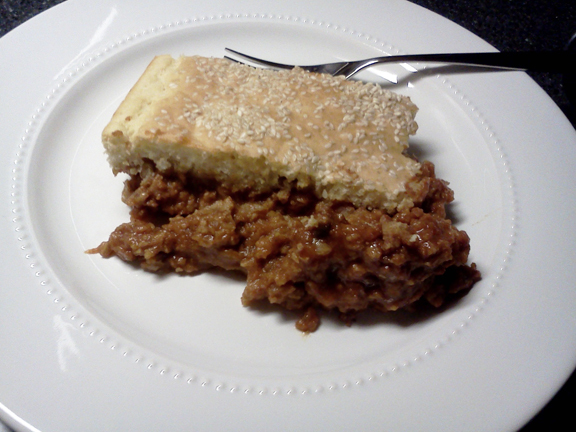 In recognition of Theodore Douglas, the WDSCB presents Sloppy Joe Pot Pie. An adaptation of the classic Southern specialty, this meatless barbecue (under a sesame seed "bun") is given a modern Georgia twist with the addition of peach preserves. Much like its namesake, this meal is both substantial and sweet and will satisfy even the heartiest appetite in your Group. It's also easy to prepare and can be ready at a moment's notice. Just like T-Dog, it is a modern classic. For Filling: In large Dutch oven, over medium heat (or medium coals) bring 2 1/2 cups of water to a boil. 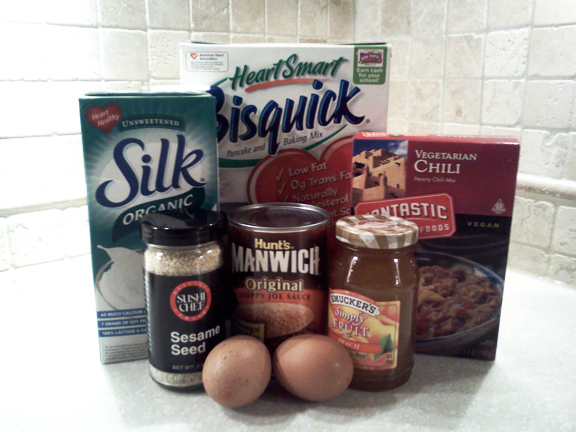 Add both packages of Fantastic Foods Vegetarian Chili mix or a whole (10 oz) package of TVP. Stir in one can of Manwich (or other brand Sloppy Joe sauce) and one whole jar of Peach Preserves. Reduce heat (or raise Dutch oven off the hottest coals) and simmer lightly (stirring VERY often). Check the texture...depending on the TVP product you choose, you may need to add more water. Add 1/4 cup at a time, until the desired texture is reached. Pour the mixture evenly into a 9 x 13 inch baking pan. Preheat oven to 400° or allow heat of campfire coals to get to red-hot while you prepare the topping. For "Sesame Seed Bun" Topping: In a large bowl, combine baking mix, eggs and soy or almond milk. Stir just until blended (do not over mix). Pour over filling mixture. Sprinkle with Sesame seeds. Alternately (for campfire cooking) add an extra 1/4 cup to 1/2 cup of soy or almond milk to topping mix to create a moister batter. Drop by spoonfuls onto filling to create "dumplings" on top of the filling, then sprinkle with sesame seeds. Cover tightly with aluminum foil and place over campfire coals. Allow to "cook" for 1/2 hour and check. Rotate pan often as needed. Pot Pie is done when the topping appears dry and spongy and golden brown. Dale Horvath was enjoying his retirement and touring the country in his RV when the outbreak began and the government fell. He met Andrea and Amy before meeting up with the rest of the Atlanta Group. His RV soon became a command post for the survivors. Dale never hesitated to give his opinion, especially when he felt the Group was taking a misstep. His calm demeanor often helped to defuse the tension when the Group was facing a difficult decision. Dale had a particular fondness for Andrea and worried constantly about her. The influence of Shane Walsh on the Group (and on Andrea) was of great concern to him. 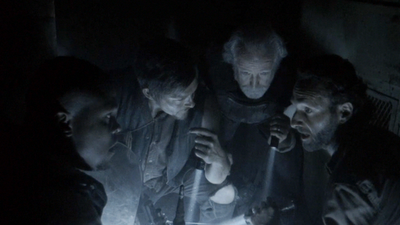 Dale shared Daryl's keen powers of observation and the two were in agreement about the mental state of the Group. Dale's greatest fear was not the Walkers, but the potential for the Group to lose its humanity. His RV was also a source of comfort to the Survivors. Even his book collection provided a sense of normalcy to the Group. Dale Horvath admired the writer William Faulkner and liked to quote him ("I give you a mausoleum of all hope and desire. I give it to you, not that you may remember time but that you may forget it for a moment now and then."). Before her death, Amy teased him about it. 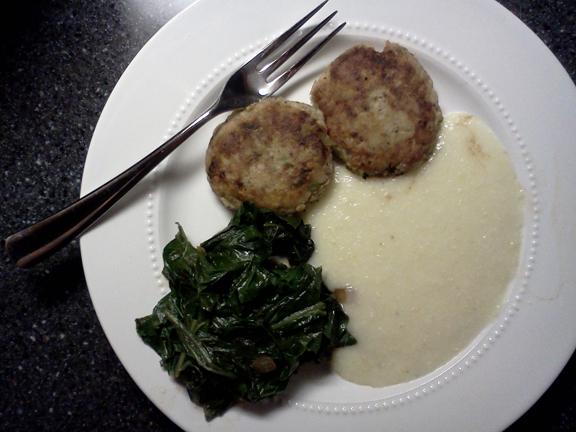 In recognition of Dale Horvath, the WDSCB presents; Salmon Croquettes with Braised Greens and Cheese Grits. These Croquettes were a favorite of Missouri native, William Faulkner. 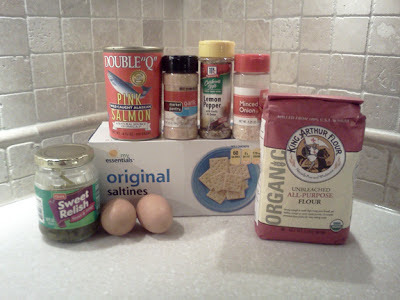 The author of this blog's own grandmother was also a Missouri native and she too, enjoyed Salmon Croquettes. Simple and subtly flavored, these salmon cakes will hit the spot when you want a quick meal. Though they utilize humble ingredients, they have a certain elegance. 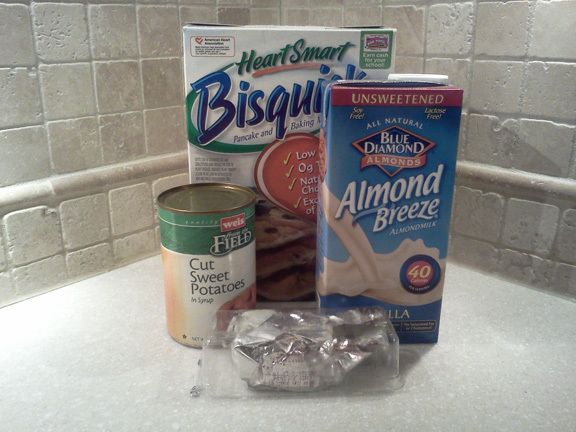 Combine all ingredients except flour and vegetable oil. Shape into six cakes. Let sit for 10 minutes. Sprinkle lightly with flour. Heat oil in a cast iron skillet over medium heat, or medium coals. Add three salmon cakes. cook for 4 minutes on each side, until golden brown. Serve with Cheese Grits and Greens. In a large saucepan over medium heat or medium coals, heat the broth and milk. Gradually, add the grits, whisking carefully. Add salt, pepper and butter sprinkles. Cook and stir constantly until soft and creamy, approximately 8 minutes. Stir in Parmesan cheese and stir well for another 4 minutes or until melted and creamy. 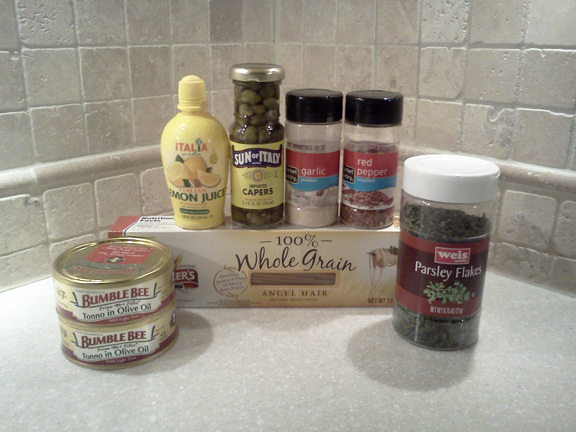 Taste and adjust seasonings if needed. Add as many greens as will fit in the pan. Season with Bacon Salt and Crushed Red Pepper. Cook, stirring frequently and adding more greens to pan as they wilt. Cook until tender, about 10 minutes.